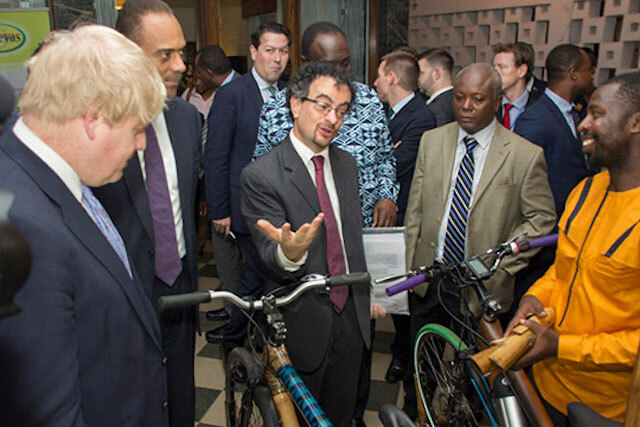 U.K. Foreign Secretary Boris Johnson (left) learns about a bamboo bicycle business run by Kwabena Danso (right) during a visit to Accra, Ghana, on February 15, 2017. 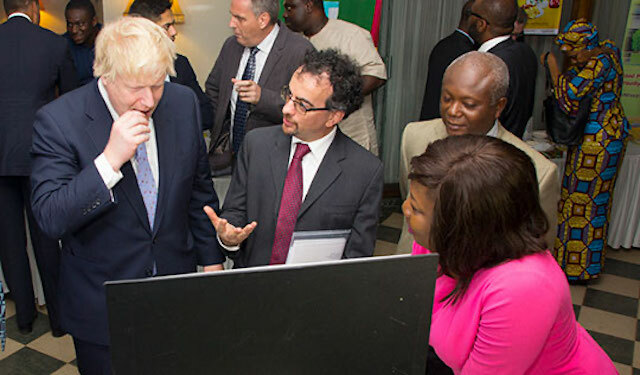 Three young and rising Ghanaian business leaders had a chance to discuss their entrepreneurial success with U.K. Foreign Secretary Boris Johnson last week during his two-day visit to Accra. Mr. Johnson sampled handmade chocolates from Akua Donkor’s business, test rode a bamboo bicycle manufactured by Kwabena Danso’s social enterprise, and learned about the sustainable ingredients Ivy Appiah uses in her company's beauty products. All three businesses have benefited from Enhancing Growth in New Enterprises (ENGINE), an entrepreneurship development program implemented by TechnoServe with funding from the U.K. government through the Department for International Development (DFID). ENGINE seeks to equip micro and small enterprises with skills and resources to improve their business plans and operations. 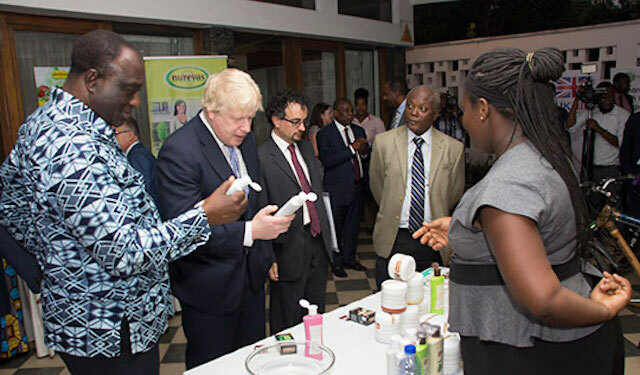 “It is refreshing to see these talented young people produce such great products from Ghana and it goes to show U.K. investments are being used well in Ghana,” said Boris Johnson. “ENGINE is helping to establish an ecosystem where entrepreneurs can access services and financing to become more competitive," said Baba Adongo, acting country director for TechnoServe Ghana. Akua Donkor (right) looks on as the British foreign secretary samples chocolates from her company, DekoKraft. For Akua Donkor, ENGINE provided an opportunity to meet other entrepreneurs and learn about better bookkeeping and marketing practices. She improved operating procedures and started showcasing DekoKraft’s unique confections, handcrafted from high-quality Ghanaian cocoa, at trade fairs. The start-up’s revenues have increased more than 11 times since joining ENGINE in 2014. Kwabena Danso, who manufactures bicycles and other products from bamboo, was able to use the seed money and business development services he received through ENGINE to scale up production at Booomers International and increase revenue twentyfold, taking in $205,000 in sales last year. The company has a mission to reduce rural youth unemployment while promoting environmentally sustainable products. Ivy Appiah (right) explains about the all-natural ingredients she uses in her beauty product line. Ivy Appiah, a biochemist by training, applied to the ENGINE business plan competition hoping to grow her cosmetics company, Tiwajo Industry Limited, which makes all-natural products with shea butter and other locally sourced ingredients. Ivy used the seed capital she was awarded through ENGINE to buy machinery that increased her productivity and to expand into high-end domestic and export markets. As a result, Tiwajo has seen a 56 percent increase in revenue. Now in its third year, ENGINE has provided seed capital and aftercare to 421 promising enterprises, which have seen revenue growth of 207 percent on average. By 2018, the DFID-funded program will support more than 1,000 micro and small enterprises through financing and business development services, helping to establish a stronger entrepreneurship culture in Ghana. See more video success stories from ENGINE entrepreneurs.